Anytime you can get away from Work and School is a good time. Throw in fishing now it’s a great time! There are some obstacles that people encounter when trying to go fishing on a family vacation. From being able to find some time away from the family to get some quality fishing time in to where you are going to pack your stuff when the car is jam packed with luggage coolers and toys for the kids. Yeah this might seem like an easy task to accomplish. Just walk up to any lake, bay, ocean or even puddle and just like that your fishing but catching is a whole different story. I’ve mentioned it in multiple different articles hopefully I’m making it very clear that google maps can be your best friend for finding fishing locations. Take some time before your trip to look over the area this is the easiest and fastest way to give a large area a look over before you actually ever go there. You may want to check out some of the Top 10 Fishing Destinations on Bullbuster.net. This seems something so simple but can be very effective. I grew up fishing the Barnegat Bay and IBSP. Every single trip down we would always stop in to Betty and Nicks to pick up fresh bait and ice. A local Bait shop is one of your best bets to get great information on what fish are currently around and what they are eating. In today’s day and age you can most likely find the local bait shops on Facebook where you can follow along the weeks ahead of your trip to see what is going on. 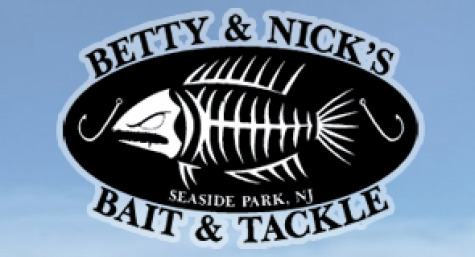 John from Betty and Nicks posts a video every day to give you a live view of what the beach looks, how the weather is and what the fishing report is. This is very valuable information that can help you fishing trip be successful. For a Great example watch the attached report at the bottom. Depending on your situation maybe your spouse is only giving you a few hours to go fishing on the trip. You don’t want to just throw a dart at the calendar and go. Taking the time to look at weather (a) moon phase (b) peak activity time (c) and tide can be the difference of you catching fish or getting skunked. This may seem excessive but it really does make the world of difference. See the links below if you haven’t read my articles on the topics labeled a, b and c.
We all know that person that when they pack to go fishing they fill the car with everything they have. 10 rods, 3 tackle boxes, buckets, waders, coolers you name it they packed it. This can be tough when you have your entire family in the car plus everything else that was packed for the trip. To be efficient you need to take the time and choose the essential items. Here is some things you can do to pack efficiently. i. Limit yourself to 1-2 rods. Depending on where you are going and what species you are targeting will help you determine if you need a 7 foot medium light rod or a 12 foot medium heavy rod. ii. Limit your gear to 1 box. - If you are only going to be able to fish for a few hours throughout the trip you don’t need 40 sinkers a 100 rigs and 500 plugs. Pick and choose a variety to be able to cover a wide basis of species. iii. Limit the extras- If you are going somewhere the water is 90 degrees you don’t need waders leave them at home. No need to waste space on something that is not needed. If you are not going to bait fish leave the rod holders at home. Up and down the whole coast there are tons of charter and party boats that run trips almost every day. There are plenty that run short trips (3-4 hours) that have a high chance of putting you on the fish. They do it for a living day in and out. They know where the fish are and they know what they are feeding on.